On the 21st: We talk about a recent story which found that Gov. 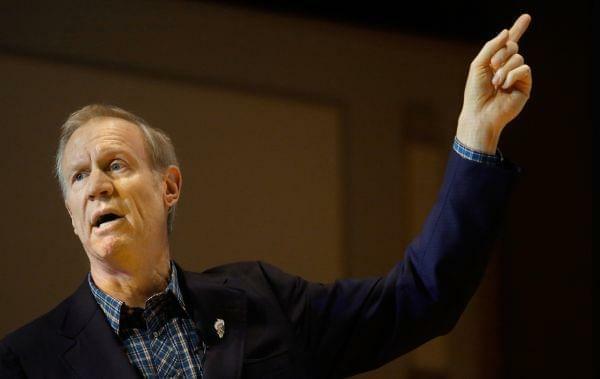 Rauner earned money from a health provider that works with ICE detention facilities. Plus, STEM summer camps for girls, and what can be done to encourage girls to pursue those careers as they grow up. And, we go over some of the most heartbreaking moments of Illinois history with our friends at the Abraham Lincoln Presidential Library And Museum. When people hold public office, they have to disclose the kinds of economic interests that they’ve invested in. Here in Illinois, our current Governor, Bruce Rauner - is worth several hundreds of millions of dollars - and his Democratic opponent JB Pritzker is worth an estimated three and a half billion. Now, a new report from Politico shows Governor Rauner profited off a health provider that works with Immigration and Customs Enforcement detention facilities, including those that house children. All of this as questions linger about how to reunite families that have been separated - and, what kinds of conditions immigrants are living in. The author of that article was with us today. Natasha Korecki wrote the Illinois Playbook for years - you might remember her as a regular guest on our state politics segment. She’s recently moved on to become a national political correspondent for Politico. "When you hear everyday on the news about Trump's hotels or his daughter's clothing line...Wilbur Ross...Scott Pruitt...eventually we start to get fatigued." Throughout the year we’ve been talking with the Abraham Lincoln Presidential Library and Museum about their Illinois 200 lists, which recognize important moments, people, and places in our bicentennial history... that you get to vote on. The website is illinoistop200.com. For the most part, these votes have been a way to celebrate our state’s 200th birthday. But, of course, there are dark moments in our past as well. And this past week’s category was called Top Heartbreaking Moments. Joining me to talk about those events and which one received the most votes is Chris Wills, the director of Communications and Public Affairs at the Abraham Lincoln Presidential Library and Museum. And Sam Wheeler, the State Historian and director of Research with the Lincoln library and museum. "History is never clean. You gotta take the good with the bad," explains @@spwheeler of @ALPLM. In the Effingham hospital fire of 1949, 74 people died, including 11 infants & the nuns who stayed with them. But it led to the adopting of national safety regulations after. Research shows that at a young age, girls are just as interested in “STEM” subjects - Science, Technology, Engineering, and Math - as boys are. But women are not equally represented in the STEM fields as adults. Last year, women earned just over 30 percent of bachelor degrees across STEM majors. That number is actually up from past years, but getting a degree is not the only hurdle. Once women enter STEM jobs, they are more likely to leave their careers than their male counterparts. That’s according to a study from the Center for Work-Life Policy. So, why are we losing so many female scientists and what can be done to change this - especially at a young age? In the studio was Michelle Rodrigues. Michelle is a postdoc researcher in the Laboratory of Evolutionary Endocrinology at the University of Illinois Urbana-Champaign. Also in the studio was is Priya Bhatt. Priya just finished her freshman year at the University of Illinois at Urbana-Champaign where she majors in Anthropology. Priya also grew up going to the GAMES STEM camp here in Urbana - GAMES stands for Girls’ Adventures in Mathematics, Engineering, and Science. "They're really capable... In this spirit of learning more about the world, all science fields are worthwhile...And it's good to find female peers."